In the past few years, we've awarded students with thousands of dollars in cash prizes. We are currently searching for funding for this contest season and would love to have you as a sponsor. Your company will be featured on our website, mailing lists, and even contest questions! In addition, your representatives will be invited to attend the on-site finals in Toronto to distribute swag and speak with contestants about products, services, and recruitment opportunities. We expect at least a hundred unique participants between the online rounds and on-site finals in May. Additionally, if you have any products that you’d like to offer, we’d love to add them on top of our cash prizes. The following table outlines the packages we offer in return for your support. 100% of all donations will go toward prizes for students, running our in-person finals contest, and maintenance of our website and contest platform. Note: donations are currently not tax deductible. Given enough demand, we may look into setting up a non-profit LLC. We truly believe that contests like the Woburn Challenge are essential in cultivating a passion for technology in the Canadian secondary school community. 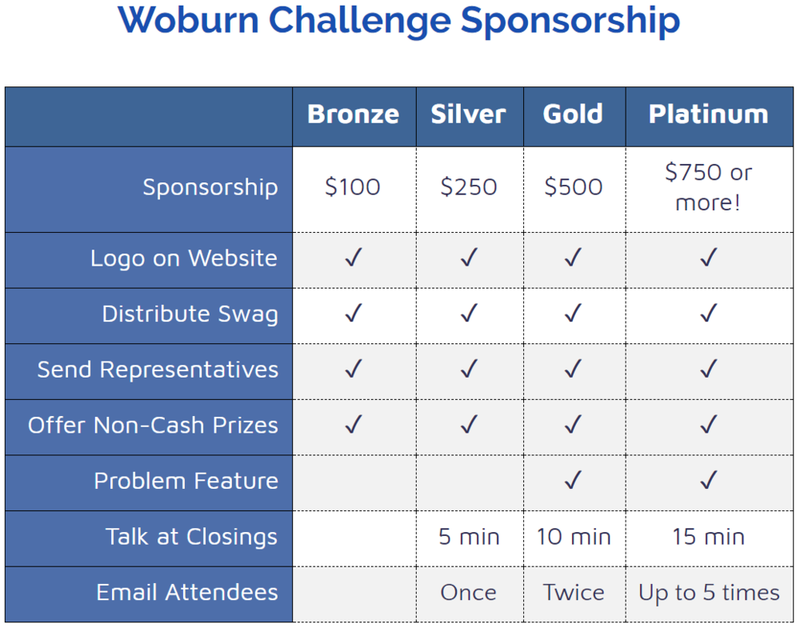 If you have any questions, please don't hesitate to email us at woburnchallenge@gmail.com. After you donate, we will get back to you within 3-5 business days with details relating to your sponsorship.